Walsine Pierce: GOING DOWN THE VALLEY: Merrill and now George. 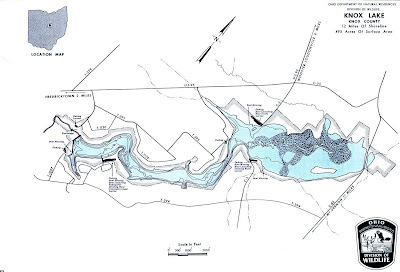 When Knox Lake was created by a dam on the Kokosing River, the waters backed over Old Mansfield Road, which now goes right under the lake. Our retreat is right at the boat launch and dock on the north shore where the lake becomes narrow. The back of our property is the parking lot of the state park. The lake flooded a forrest at our end of the lake. Today most of the tree tops are down leaving a lake full of stumps. Difficult for boating but great for fishing. Today Julie and I drove down to the families retreat. We did not use the retreat at all last year. Julie was not at the lake at all and I was only there for a few minutes once. We were pleased with how well the property got along without us. A friend, Ernie, kept the lawn mowed for me for which I take him strip steaks. We were thrilled to be reminded how pretty it was inside, although the outside needed a bit of help. After deciding what she would need to make it livable for me when the weather warms up a bit we headed for dinner at the Cracker Barrel with daughter-in-law Mary Kay. Mark was at the Ashland Seminary tonight working on his second master's degree. We drove through the neighborhood looking for changes. As we drove by my friend George Miller's home I said "George is home". Both his car and truck were in his driveway. Two young men were in his driveway. I stopped and asked "how's George"? Sadly, they informed me that George had died of a massive heart attack in December. I'll miss George. A bit younger than me we frequently went to breakfast together. Sometimes just for coffee and a chat. More often we happened to meet at the lake where we might "chew the fat" for an hour or so. George was a retired carpenter that worked for the state. In retirement he made furniture and helped with his two children's needs. He was a good guy. He was a friend. Merrill was a retired butcher who was a bit older than me. He sold his butcher shop in Columbus, Ohio several years prior to my meeting him at the lake. When he sold his shop he moved to the Knox Lake community. He also purchased property in Texas where he spent his winters. Like George, Merrill had serious health issues. He had a bad ticker and had had multiple surgeries. He also had leg problems. He walked faithfully using a walking stick. We didn't spend the same time together that George and I did but almost every day Merrill and I chatted for a while as we met along the way. He died about five years ago. I still miss him. The lake is still there. I am still here. I am thankful. A man who lives fully is prepared to die at any time"